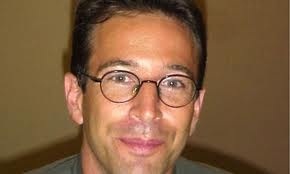 This L.A. Press Club award is meant to keep alive Daniel Pearl’s memory and spirit. It also continues to be a tribute to the many other journalists killed in the line of duty around the world and the many other reporters, editors, cameramen and correspondents who put their lives on the line every day to preserve the rights of a free press. The Los Angeles Press Club will present its tenth consecutive Daniel Pearl Award For Courage and Integrity In Journalism at its 54th Southern California Journalism Awards Gala Sunday, June 24, 2012 at the Millenium Biltmore in downtown Los Angeles. On June 22, 2002, the first Pearl Award was presented in memorium and accepted by his family at the 44th L.A, Press Club Awards. This award is named for the 38 year-old Wall Street Journal reporter slain while on assignment in Pakistan. Based in Bombay, India as the Journal's bureau chief for South Asia, Pearl was covering the war on terrorism, accompanied by his French journalist wife, Mariane, who was six months pregnant with their first child. He was working on a story in Karachi about Islamic radicals when he was kidnapped and brutally murdered. This award is meant to keep alive Pearl’s memory and spirit. It also continues to be a tribute to the dozens of other journalists killed in the line of duty around the world and the many other reporters, editors, cameramen and correspondents who put their lives on the line every day to preserve the rights of a free press. Last year the award went to NBC’s Richard Engel. Those who followed included Anna Politkovskaya, Michael Kelly, Kevin Sites, Bob Woodruff, Anne Garrels, Michael Weisskopf, Robyn Dixon and Jesus Blancornelas. The Daniel Pearl Award is jointly presented by the Los Angeles Press Club and The Pearl Family. Another anniversary will be noted at the Club’s awards gala in June. Former Washington Post reporters Bob Woodward and Carl Bernstein will be honored for their series of investigative stories that led to the resignation of President Nixon. They will receive The President’s Award on the 40th anniversary of the Watergate scandal.